After two days of pouring over the entire online manual and editing with Final Cut Pro X I have to say there are things I love about it that I’ve always wished Final Cut Pro had (performance, integrated metadata support, background processing), and things that are deep disappointments (lack of XML import/export, lack of multitrack audio editing, splitting tracks, exporting stems). Final Cut Pro X is like a precocious teenager that still has some growing up to do before they are ready for the adult world, but they have prospects, and we simply have to take a wait and see attitude. I can’t depend on it for mission critical work, however, I will use it for editing and see what it can do, and over time, and as it evolves, it might become part of my professional workflow. I like the product and I think Apple did more things right than wrong. We have to take a moment to pause and reflect this is a version 1.0 product, not 10.0 like the splash screen states. But the things that are missing are not consistent with the hype, and there lies the rub. It’s possible that the way this product was released at the same time support for the current version was dropped may have done huge damage to the brand among professionals, but on the other hand Final Cut Pro X bring excitement and sizzle to the majority of people editing everything besides professional productions that require complex workflows and resource sharing. This much larger group is the future. Sophisticated editing has become democratized. Apple is betting on the new generation. When it comes to shareholder value and market share, there is no room for nostalgia or catering to the old ways. Leave the pros in the dust, their days are numbered, at least that’s the message I hear through Apple’s actions. Apple can say they support professionals, but their actions say otherwise, and as Aristotle reminds us in The Poetics, character is revealed through action. It’s clear that the future lies in tens of millions of individual editors, not in tens of thousands of professional editors. I’m sure many of the missing pro features will be added. Larry, this post has been very useful and thought provoking. While Final Cut Pro X has a slick interface and provides sizzling performance, I can’t imagine using it in a professional environment. Without the ability to place audio in individual tracks for exporting to a sound editing and mixing application, without multi-cam, without the ability to import legacy Final Cut Pro projects, without EDL or XML export for transferring work I can’t take it seriously in a professional environment. This resets the clock back to version 1.0 and it’s a travesty. [PAUSE] sip on Apple Kool-Aid [PAUSE] Final Cut Pro X is revolutionary, it’s awesome, it’s what we’ve all been waiting for! 64 bit performance, background rendering, new interface, none of this could have been done in an evolutionary way the way Adobe does with their applications, Apple is about revolution and what Apple tells us we’re going to like, we’re going to like, and two or three versions later, we’re all going to say, why did we not do it like this all along? 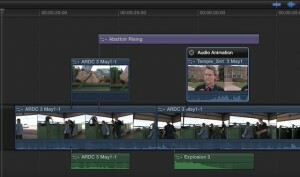 Philip Hodgetts: What are the Answers to the Unanswered Questions about Final Cut Pro X? At the end of the day, I think much of the anger and frustration is ultimately about the gap between what works today (Final Cut Pro 7) and what is promised (some future version of Final Cut Pro that supports a professional workflow). In this interim many of us will have to continue using Final Cut Pro 7 with no idea how long this gap is going to be with our work, our livelihood now depends on an unsupported product. Imagine the outcry if Avid did the same thing to their users? But Avid would never do this, their editing applications are their livelihood, on the other hand, Final Cut Pro is a tiny sliver of Apple’s business, and so given this fact we have plenty of justification in being concerned, it’s hard not to feel as a professional and educator that the rug has been pulled from under me and there is no soft landing in sight. DVinfo.net: FCP X Now available to buy and download from App Store. In some ways this break between the old ways of Final Cut Pro and what would have better been called iMovie Pro 1.0 gives us all a chance to re-evaluate our choices of editing tools. I started on Avid, perhaps it’s time to take a look at where they are at, I stopped using Avid with the introduction of Final Cut Pro 4.5 in what now seems like ancient times. This might also a good time to see if Premiere Pro is worthy of this role, since Adobe has a good track record of evolving applications and not leaving their professional users out in the cold as they evolve their products (I’ve been using Adobe Photoshop since version 1.0). The time has come to look around and play the field, for no matter what happens in the future, one thing is for certain, Final Cut Pro as we know it has come to the end of the line, it is a dead product with no support. We have to consider the tradeoffs of jumping over the chasm between where we are with Final Cut Pro 7 and the promises that Final Cut Pro X will grow up fast enough to meet out needs and fulfill our desires. For now I will continue editing my mission critical work with Final Cut Pro 7 and experiment on short projects with other tools and see what happens. The day Final Cut Pro 7 stops working due to an OS X update or new hardware incompatibility will force a change, but for now, it’s still smooth sailing with a lot of underlying anxiety that comes with editing on a dead platform. Video from Abattoir Rising, a work-in-progress documentary by Audrey Kali and David Tames. Seems to me and my staff that Apple has ‘dumbed’ FCP down to be more of a “iMovieX” product with a consumer focus, leaving professional users in the mist. The fact that the new FCPX won’t allow you to open projects from earlier versions of FCP is ridiculous. I don’t see the logic in Apple essentially abandoning what it has established as a core product for millions of pro users. What next? Thanks for offering your impressions. Like you, I’ve been following a lot of discussions and have drafted some thoughts. I can understand the frustration many pros are feeling about the end of FCP as it was. But having gone through these things before with many software programs, my experience has taught me that any good tool that is power dependent will be redesigned and improved repeatedly over time and it is up to the user to make the adjustment. Sure there are trade-offs, there always are, but Apple has always (to my mind) delivered a product that takes new hardware into account without the hassles one can have with other companies and their licensing issues. I see this new FCP X as a natural progression. I understand how some folks can get attached to their process. But honestly, when I see 8 semis parked outside a film location, and I see banks of monitors at the video village—well, fact is no one needs all that stuff to get the job done. I see FCP X as the future of pocket filmmaking: super fast, easy to use, and (because it will use less processing power) portable. Which means more jobs turned around faster. you know.. I here Premier will open FInal Cut 7 files? Matt, Yes, Adobe Premiere Pro will open Final Cut 7 projects. I took it for a spin last week and it’s surprisingly similar to Final Cut Pro. A viable alternative for people who need to work with their legacy projects. Paul, I appreciate your thoughtful write up on Final Cut, thanks for sharing. In a recent Apple Keynote – I can’t remember which – either Mr Jobby, or one of his lackeys, (again, can’t remember who, all the self-congratulatory whooping must have made me glaze over), made great issue of Apple’s future in ‘portable devices’. This term is a lot more loaded than may at first be obvious. Apple’s ‘portable devices’ are blatantly populist; the iPod, iPhone and iPad all pitch to a lifestyle market rather than the professional user. In fact, the iPad is so limited in its creative capability that it seems positively hostile to the creative user. These are the units, however, that have thrown Apple at light speed to the top of the tree and revolutionized the company’s fortunes. Don’t be surprised if the Macbook Pro and its big brother tower unit the Mac Pro fade to oblivion during the next five years or so. Apple neither respects nor values its professional creative customers anymore, and this is blatantly demonstrated in its re-working of Final Cut “Pro”. It’s a joke! (Apple always took pains to include soundbites from Hollywood types on its website, rightly singing the praises of previous incarnations of FCP as one of the best creative tools available for pro video work. Let’s see what they have to say about this new animal. I’ll bet that Apple won’t be so keen on quoting them from now on). The days when professional video creatives were glad to say they worked on a Mac could be coming to an end if Apple continue along this dumbed-down route. We don’t like to feel betrayed, but can only do so in light of the new abomination that Apple has the cheek to call a ‘pro’ application. iMovie Advanced. That’s all it is, I’m afraid. I never thought I’d say this, but thank god for Adobe and Avid. What can we expect next from Apple? Garage Band Pro?